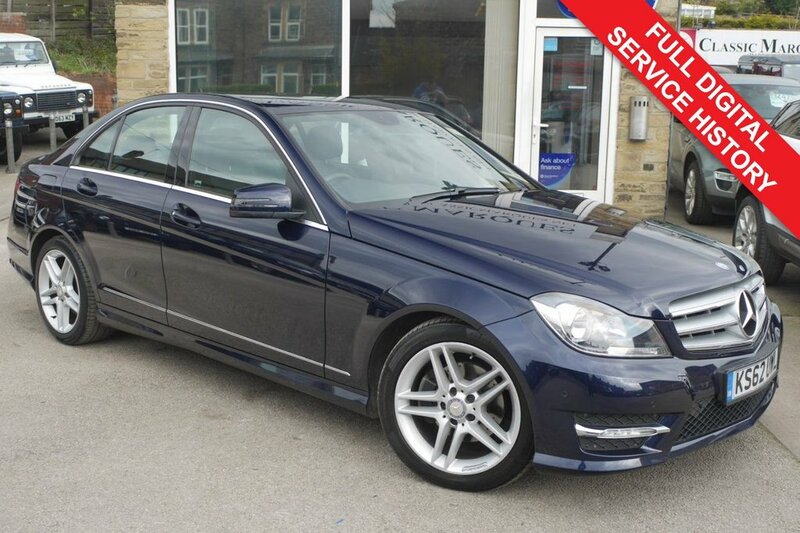 MERCEDES C CLASS 2.1 C220 AMG SPORT in beautiful condition with only 36000 miles. the automatic Mercedes is well equipped with Black leather upholstery, Dual climate control, heated seats, Cruise control, electric windows and mirrors with power fold function, part electric seats, AMG alloy wheels and styling, F1 style paddle shift gear change, Auto boot opening, Bluetooth Mobile Phone connection, CD Radio and USB/auxiliary connections for your preferred entertainment selections.Smooth and comfortable to drive, the economical compact Mercedes has the timeless elegance of the Marque finished in Deep Blue metallic with black leather upholstery. The C Class has the benefit of a full digital service printout confirming its excellent all round condition and low mileage. Two keys are supplied with full book pack, MOT, Service, Comprehensive Warranty and will undergo a full PDI prior to handover. We can deliver anywhere on the UK mainland.